"Just imagine, you are in the service of the Lord Jesus Christ! Such an important call! Such an awesome assignment! This is your call to serve him. This is your chance, your blessed opportunity." 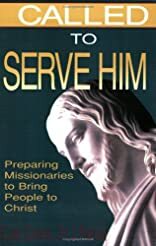 Approaching their topic with this kind of enthusiasm throughout, Elaine Cannon and Ed J. Pinegar here describe just what it means to be a missionary in the Lord's service, covering everything from receiving the call to continuing to share the gospel throughout one's life. Addressing their comments primarily to the prospective missionary--young and old, Elder and Sister--the authors draw on wisdom from the scriptures as well as from modern prophets and from personal experience to provide concrete, practical suggestions that can help missionaries succeed. An especially helpful set of chapters on personal development tells missionaries how to cultivate essential qualities such as integrity, obedience, humility, steadfastness, and self-mastery. About Ed J. Pinegar (Author) : Ed J. Pinegar is a published author. Published credits of Ed J. Pinegar include Called to Serve Him, Preparing for Your Mission.